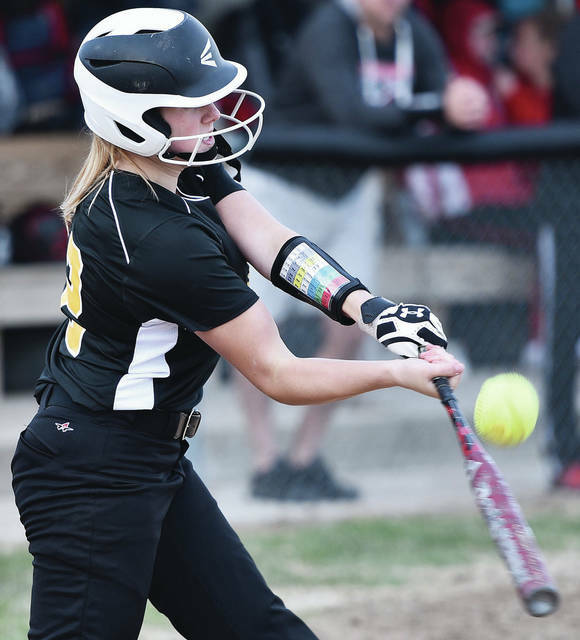 Sidney Allie Herrick swings during a Greater Western Ohio Conference American North Division game on Tuesday in Sidney. Sidney Lauren Barker swings during a Greater Western Ohio Conference American North Division game on Tuesday in Sidney. 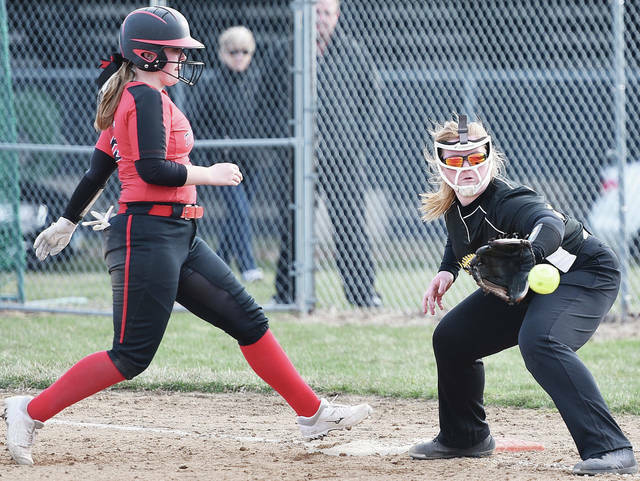 Sidney's Hallie Westerbeck takes the throw to second as Tippecanoe's Brooke Aselage arrives during a Greater Western Ohio Conference American North Division game on Tuesday in Sidney. Sidney's Hallie Westerbeck throws to first as Tippecanoe's Emma Watkins passes her on the way to second during a Greater Western Ohio Conference American North Division game on Tuesday in Sidney. Sidney's Madison Osborne gets to third with the ball before Tippecanoe's Brooke Silcox during a Greater Western Ohio Conference American North Division game on Tuesday in Sidney. 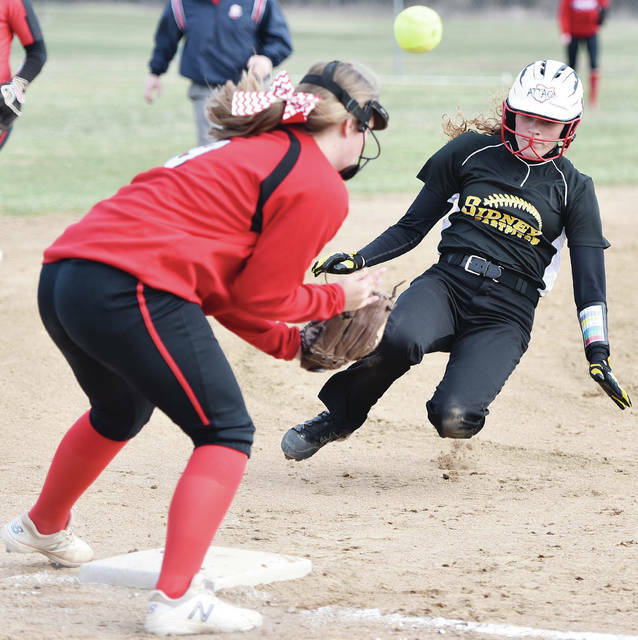 Sidney's Allie Herrick waits for a ground ball as Tippecanoe's Brooke Silcox runs for third during a Greater Western Ohio Conference American North Division game on Tuesday in Sidney. Sidney Madison Osborne throws to first as Tippecanoe's Brooke Silcox runs to second during a Greater Western Ohio Conference American North Division game on Tuesday in Sidney. Sidney's Alli Milanese attempts to pick-off Tippecanoe's Brooke Silcox at first base during a Greater Western Ohio Conference American North Division game on Tuesday in Sidney. 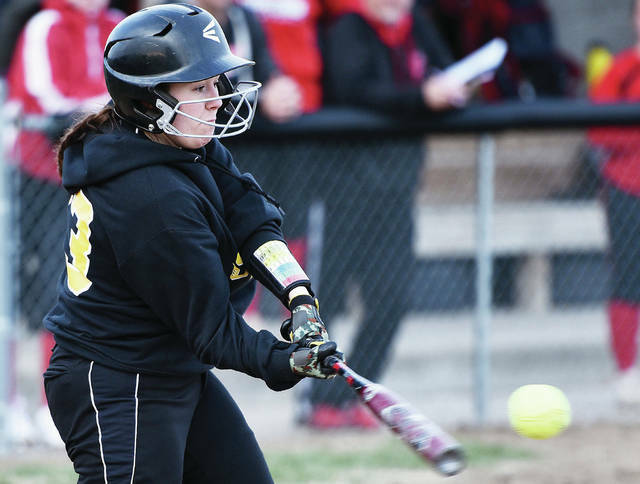 Sidney pitcher Lauren Barker scoops up a short hit during a Greater Western Ohio Conference American North Division game against Tippecanoe on Tuesday in Sidney. Sidney's Madison Osborne goes into a slide as Tippecanoe's Savannah Wead struggles to get a throw under control during a Greater Western Ohio Conference American North Division game on Tuesday in Sidney. Sidney’s Alli Milanese tries to pick off Tippecanoe’s Brooke Silcox during a Greater Western Ohio Conference American North Division game on Tuesday in Sidney. 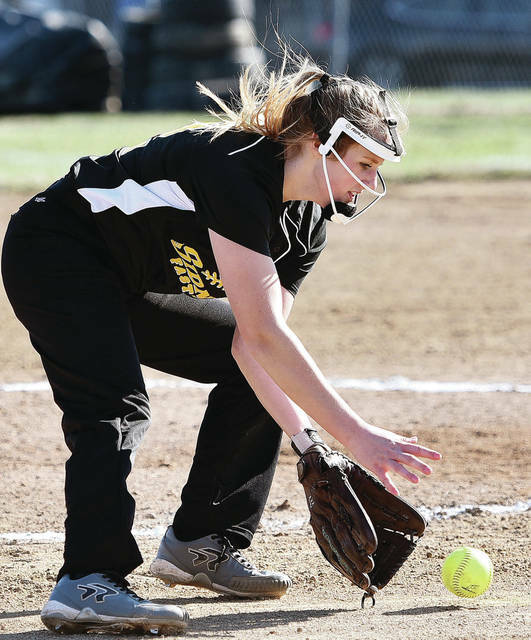 SIDNEY — Sidney managed four hits against Tippecanoe and dropped a Greater Western Ohio Conference American North Division softball game 7-0 on Tuesday. 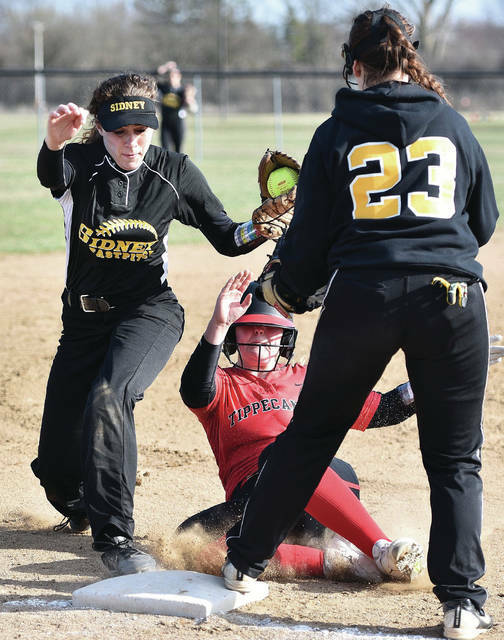 The Red Devils accumulated 14 hits against Sidney pitcher Lauren Barker on their way to completing a two-game sweep of Sidney in consecutive days. Barker allowed five earned runs and had seven strikeouts and five walks in seven innings. Sidney’s best chance to score came in the fourth inning. Madison Osborne led off with a bunt single and Hallie Westerbeck followed with a single on a hard ground ball to left field. The next batter struck out, but Osborne stole third and Westerbeck advanced to second during the steal. The next two batters hit into routine infield outs to end the inning. The Red Devils scored two runs in the second to take control and then blew the game open with three in the fifth and two in the sixth. 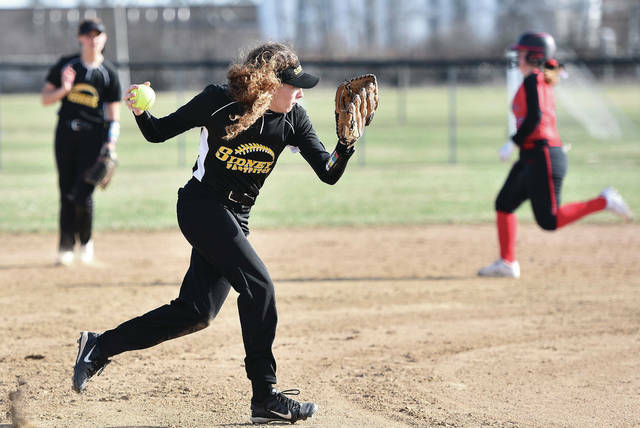 The Yellow Jackets committed four errors while Tippecanoe didn’t commit any. Allie Herrick had two stolen bases. Tuesday’s game was Sidney’s home opener. Russia bounced back from a loss to Anna on Monday by beating St. Henry on the road on Tuesday in nonconference action. Both squads scored one run in the first inning. Russia took a 2-1 lead in the second but the Redskins scored one in the fourth to tie it. The Raiders scored in the top of the fifth to take control and held on from there. Russia had five hits and one error while St. Henry had six hits and one error. Riley Hammonds was 2 for 3 for Russia and scored one run. 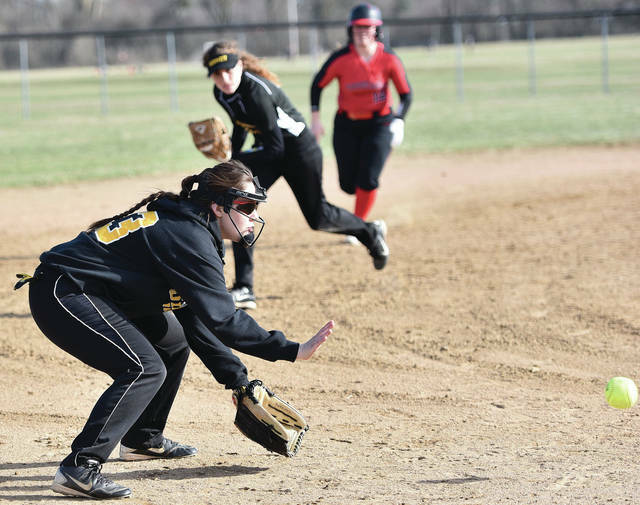 Olivia Moorman stole two bases while Hammonds and Kendall Monnin each stole one. Morgan Wenrick picked up the win in the circle. She allowed one earned run and had two strikeouts and no walks in seven innings. Five errors proved costly for the Redskins in a home nononconference game on Tuesday. Though they were outhit 14-10, the Flyers capitalized on Loramie’s errors and didn’t commit any themselves. Fort Loramie took a 4-0 lead in the first inning but Marion Local scored three in the second and seven in the third to take control. The Redskins scored four runs on four hits in the seventh but couldn’t complete a comeback attempt. Aleah Frilling was 2 for 5 with 3 RBIs and two runs. He two hits were a double and a home run. Aubrey Baker hit a three-run home run in her only plate appearance, which came in the seventh inning. Macy Imwallke was 3 for 4 with two doubles. Ellie Holthaus was 2 for 3 and Cassidy Albers was 2 for 4. Desiree’ Fogt had a double. Frilling was charged with the loss. She allowed six earned runs on nine hits in 6 1/3 innings and had five strikeouts and one walk. Laura Bergman pitched 2/3 of an inning and allowed one earned run on one hit and two walks. The Cardinals earned a run-rule win in five innings in a nonconference game on Tuesday in Sidney. They scored two runs in the first, one in the second, five in the third and six in the fifth. Fairlawn’s run came in the first. New Bremen had 13 hits. Abbi Thieman, Marissa Topp and Kira Bertke each had two hits. Bertke hit a home run and Taylor Paul hit a double. Erin Smith picked up the win. She allowed one earned run in three innings on one hit and had six strikeouts and three walks. Sarah Parker gave up one hit in two innings and had three strikeouts. Renee Gent and Ashley Roush had Fairlawn’s hits; Gent’s was a double. Skylar Jones was charged with the loss. She allowed nine earned runs and had one strikeout and five walks in five innings. The Wildcats earned a big nonconference win on Tuesday in Minster. They had 15 hits and two errors while Jackson Center had two hits and six errors. Minster took control with eight runs and then added seven in the third to run away. Samantha Trego was 3 for 4 with 3 RBIs and three runs while Emily Stubbs, Danielle Barhorst, Jenna Poeppelman and Mara Schmiesing each had two hits. Laney Hemmelgarn and Trego each had a double and Lindsey Albers hit a home run. Hemmelgarn picked up the win in the circle. She allowed one earned run and had five strikeouts and four walks in five innings. Kenleigh Fortner was charged with the loss. She allowed 12 earned runs on 10 hits in 2 2/3 innings and had one strikeout with six walks. Fortner and Kennedy Jackson picked up Jackson Center’s hits. The Cavaliers lost a home Northwest Central Conference game on Tuesday. Elgin had 16 hits and no errors while Lehman had three hits and three errors. Annie Stiver was charged with the loss for Lehman. She had four strikeouts and three walks. Angela Brunner had all of Lehman’s hits. She had a single, a double and hit a two-run home run. The Pirates scored one run in the sixth inning and held Ridgemont scoreless in the bottom half of the inning to earn a run-rule win in a road NWCC game on Tuesday. Riverside had 11 hits and one error while Ridgemont had four hits and 11 errors. Leah Kelsey was 3 for 4 with 1 RBI and one run while Shelby Giles was 3 for 4 with three runs. Jalynn Stanley was 2 for 4 with 2 RBIs and one run. Giles, Kelsey and Courtnie Smith each had doubles. Stanley picked up the win. She allowed two earned runs on three hits in four innings and had three strikeouts with one walk. The Tigers took advantage of four errors by Northmont and earned a nonconference win on Tuesday. Versailles had seven hits and one error; Northmont had 10 hits. The Thunderbolts scored two runs in the first and added one each in the second in third. The Tigers scored three in the third and two in the fourth to take a 5-4 lead, but Northmont re-took the lead with two in the fifth. The Thunderbolts held a 6-5 lead until Versailles scored two in the seventh. Northmont walked in the winning run. Hannah Barga was 2 for 4 with 2 RBIs for Versailles while Faith Huddle was 2 for 3 with 2 RBIs. Barga hit a home run and Caitlin McEldowney doubled. Lauren Monnin picked up the win. She gave up two hits and had two strikeouts and one walk in 2 1/3 innings of relief work. Tara Fritscher gave up six earned runs on eight hits and six walks in 4 2/3 innings. 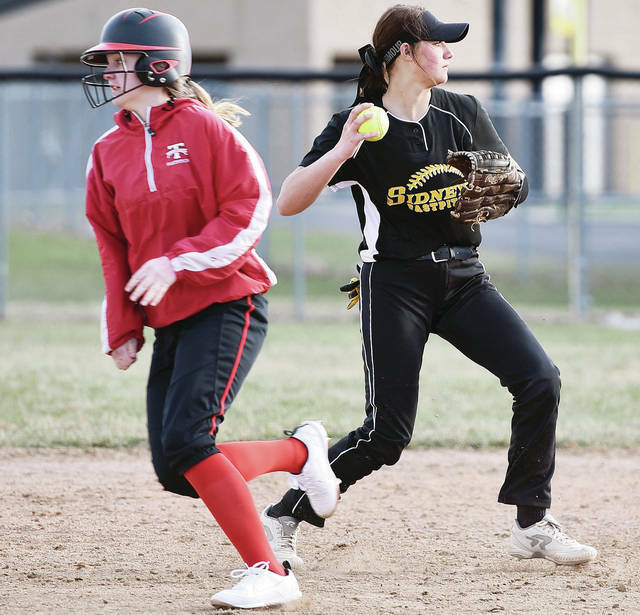 Sidney’s Hallie Westerbeck takes the throw to second as Tippecanoe’s Brooke Aselage arrives during a Greater Western Ohio Conference American North Division game on Tuesday in Sidney. Sidney’s Hallie Westerbeck throws to first as Tippecanoe’s Emma Watkins passes her on the way to second during a Greater Western Ohio Conference American North Division game on Tuesday in Sidney. Sidney’s Madison Osborne gets to third with the ball before Tippecanoe’s Brooke Silcox during a Greater Western Ohio Conference American North Division game on Tuesday in Sidney. 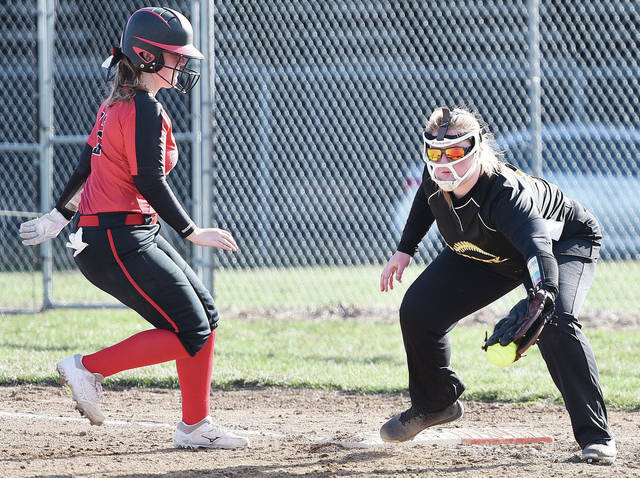 Sidney’s Allie Herrick waits for a ground ball as Tippecanoe’s Brooke Silcox runs for third during a Greater Western Ohio Conference American North Division game on Tuesday in Sidney. Sidney Madison Osborne throws to first as Tippecanoe’s Brooke Silcox runs to second during a Greater Western Ohio Conference American North Division game on Tuesday in Sidney. Sidney’s Alli Milanese attempts to pick-off Tippecanoe’s Brooke Silcox at first base during a Greater Western Ohio Conference American North Division game on Tuesday in Sidney. Sidney’s Madison Osborne goes into a slide as Tippecanoe’s Savannah Wead struggles to get a throw under control during a Greater Western Ohio Conference American North Division game on Tuesday in Sidney.